Suzanne Loebl is the award-winning author of fourteen books. 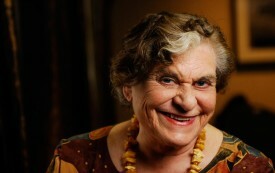 In 2012, the American Society of Journalists and Authors awarded her its Lifetime Achievement Award. Her books include At the Mercy of Strangers: Growing Up on the Edge of the Holocaust, The Nurse’s Drug Handbook (seven editions), America’s Medicis: The Rockefellers and Their Astonishing Cultural Legacy, and The Mother’s Group: Of Love, Loss and AIDS. She maintains a regular blog at branchingblog.com. A Holocaust refugee speaks out against Trump’s Muslim ban.